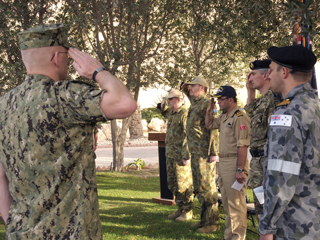 Australian Sailors from Combined Maritime Forces (CMF), deployed to U.S. 5th Fleet area of responsibility, held a service at U.S. Naval Forces Central Command headquarters at dawn, April 25. Capt. 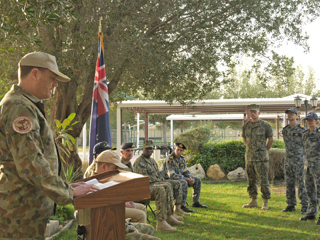 Bruce Legge, Royal Australian Navy, director of operations, Combined Maritime Forces, spoke of the significance of ANZAC Day during the service. The service, which was attended by U.K., Australian, Turkish, New Zealand and U.S. personnel, commemorated the 97th anniversary of the Australian and New Zealand Army Corps (ANZAC) landings at Gallipoli, Turkey during World War I. The Gallipoli battle lasted eight months until the Allied Forces were evacuated after both sides suffered heavy causalities. In 1916, Australia and New Zealand officially named April 25, ANZAC Day and is a national day of remembrance. Capt. Bruce Legge, Royal Australian Navy, director of operations, Combined Maritime Forces, welcomed those in attendance and spoke about the significance of ANZAC Day and how the dawn service is symbolic of the dawn landings at Gallipoli. “This is the day we celebrate the sacrifices of our service members of not just Gallipoli, but of all wars. The Battle of Gallipoli is significant to Australians because it was one of the first international events Australians took part in as a new nation. In this sense it was a defining moment for Australia as a country,” said Legge. The service concluded with the playing of the “last post,” followed by a minute of silence and then the Australian National Anthem. ANZAC Day attendees salute as they play the Australian National Anthem. ANZAC Day remains one of the most important national holidays for Australia and New Zealand and is also observed in the Cook Islands, Niue and Tonga. ANZAC Day is typically celebrated with memorial services, military parades and festivals to recognize armed forces veterans and active-duty military.